First she must convince Ruzalia to help her. The fierce pirate captain saves those who face terrible fates on Ixion, but that doesn't guarantee their gratitude. Instead, she faces a revolt - and Naif is caught in the middle. Naif will need all her courage to survive. For Lenoir, who wants to keep her safe, for her friends Suki and Rollo, if they live, for Markes, who has secrets of his own, and for the new friends she will make on this journey. 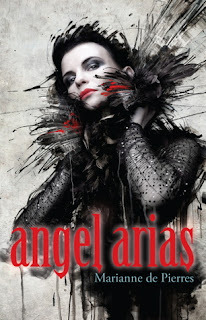 Angel Arias takes fans of Marianne de Pierres’s Night Creatures Series one step closer to the end. Burn Bright was a dark, fantastic opening for the series and Angel Arias follows with all of de Pierres’s sinuous style and flair for world-building. Retra, now called Naif, is determined to discover the secrets that bind together the mysterious island of Ixion and the home she ran from – Grave. Since leaving Ixion with the pirate Ruzalia, Naif’s been unsuccessful in convincing her to take her to Grave to investigate. Unfortunately, life on the pirate’s home isn’t as far removed from Ixion and Grave as everyone believes. As tensions rise between Ruzalia and her unruly rescues, the only hope for Naif’s friends, caught in the war between Ripers, is the answers on Grave. Marianne’s world-building is by far the most impressive aspect of this novel. The way she introduced us to Ixion and the system the runaways had to follow under the Ripers in Burn Bright was astounding. Now Marianne’s given us so much more from this world to make it even more believable. Extending the scenery to Grave, a place we’ve caught but just a brief glance and about which we’ve read the horrible tales, enhances the dystopian theme. It’s as if she’s plucked an underlying layer from the plot and brought it to clearer focus with tones of dread, fear, and hope. Marianne is excellent when it comes to creating scenery, then describing that scenery to life. Naif’s exploration through Grave was extremely daunting and readers will be able to feel the tension of discovering secrets that could either help or hurt Naif, and her friends, the worry about Naif and Markes getting caught, and the nagging sense that danger is just around the corner. Burn Bright had quite a few frequent characters that lightened the story: Suki and Rollo, mostly. This time around the new secondary characters we’re introduced to are a mix between humorous and serious. Angel Arias brings forth more insight into secondary characters like Markes, for example. He’s also a previous Grave resident, but he carries a heavy past that actually comes in handy during his and Naif’s brief time there. Naif acknowledges the new side of her that's freer and embraces it. Going back to her home that is filled with strict, oppressive rules puts a slight blip in her steps, but Naif keeps a brave face to meet her goals. Even as Naif and Markes are away from the action on Ixion, Marianne keeps us in the loop. Lenoir has a few moments to shed light on his motivations and thoughts and I love that he’s still a big mystery. Even after reading this second book in the series much of what I think I know about Lenoir is made up of assumptions. Shine Light, the third, and sadly last, installment of the Night Creatures series will be an epic conclusion. I cannot wait to see how Naif’s new persona handles the raging war ensuing between Ripers and the rebels on Ixion. Then, there’s the matter of Naif and Lenoir’s shadowy connection that is romantic and potentially dangerous all at once. Angel Arias is the perfect bridge to reflect Marianne de Pierres’s ingenious storytelling! Don't forget! You can join the Burn Bright Book Club (BBBC) for awesome-sauce reviews and chances to win books every month! So, so glad you liked this!